We Specialize in Repairing, Rebuilding & Restoring of Classic British Motorcycles from the 1950's, 1960's and 1970's. Our expertise in engine rebuilding and machine work for motor overhauls is all done in-house, with few exceptions. With over 31 years working on British Bikes, we have found betters ways and tooling to take care of problems common to these bikes. At Redline Cycle repair means troubleshooting and fixing what is wrong, not replacing every part that 'may' be the cause. We take a systematic approach to troubleshooting. We have experience in seeing a large number of problems before and having better solutions to difficult problems. Experience that results in a higher quality of workmanship. Over 30+ years experience in working on Classic British Motorcycles, and having seen and dealt with problems few have seen before, results in less time diagnosing and repairing and a cost savings to you. Mouse over the photos below to learn more about how we can Repair | Rebuild | Restore your classic British bike. Basic repairs are sometimes the only thing needed to get you back on the road to riding again! From Tune-Ups to New Tires and a Professional Look Over to see what is needed. If you need more than simple repair work, we can help Rebuild your dream bike. 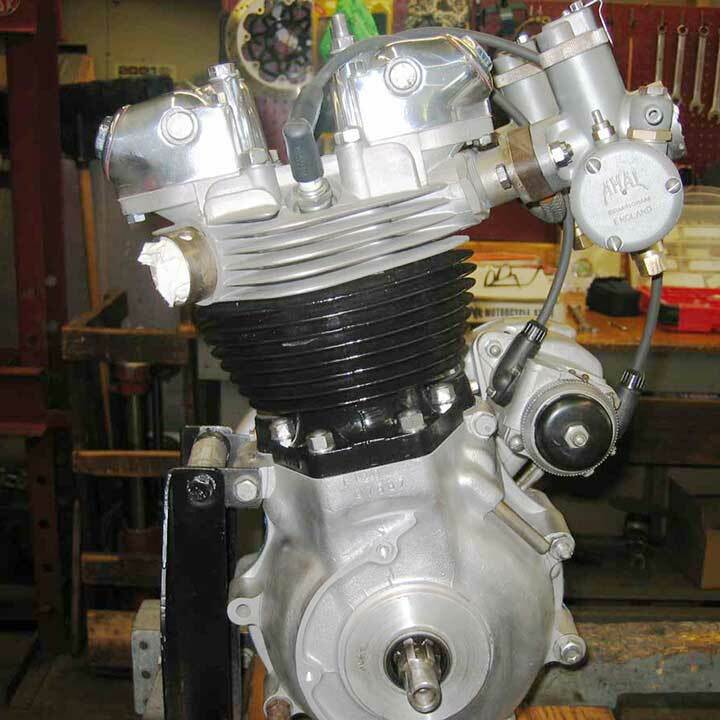 We can do an engine refresh / rebuild that will make your bike dependable and fun to ride again! If you are looking to have your bike look and run like new again, we do it all, from Frame On and Frame Off to Full Custom Restoration that will put your bike back in showroom condition! See why we are the best in the Midwest. Check out some of our repair, rebuilding and restoration work below. We can get you back on the road with a few simple repairs, if that is all that is needed. 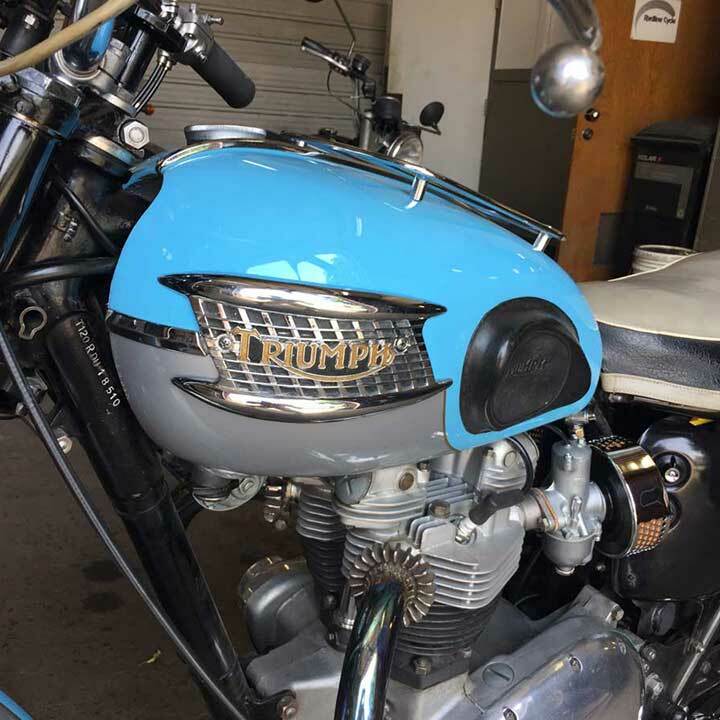 Take a look this beautifully repaired 1965 T120R Bonneville. We replaced the monobloc carbs with newer style concentric carbs. We replaced the shocks, new fork springs, and previously did a top end job on the engine and put new rims, tires and spokes (relacing and truing the spokes), with updated stainless steel versions. Click on the photo to the right to launch a slide show of this beautiful T120R Bonneville. Engine rebuilding is a large part of our business. If you like working on your own bike but don't have the equipment or are not comfortable doing engine work, we got you covered! You can send us the head, cylinder, or complete engine. We use the best parts available and try to improve on what came from the factory. Our in house machine shop can handle most any repair jobs requiring custom or even difficult welding and machine work. This bike came into the shop in very bad shape, neglected, rusty and everything worn out. The customer wanted it back to showroom stock condition down to original paint. He was very pleased with the end result, as it turned out better than new. Click on the photo to the right to launch a slide show of this frame off rebuild of a 1970 T120 Bonneville. This bike was not so far gone but still needed a lot of help. Goofy handlebars, bad paint, fiberglass tank and other cosmetic problems. After a major tune and some clutch work it ran good and was mechanically sound. Frame paint was touched up and a lot of time spent on cleaning and polishing. New steel tank and paint, new exhaust, seat cover and so many other minor things it is hard to remember them all! This restoration turned heads wherever it went and rides as good as it looks. The red paint job and polishing really made this bike stand out. Every aluminum part got buffed out down to the handlebar switches. Click on the photo to the right to launch a slide show of this beautiful 750 Commando! A customer of mine had a 1976 T140 new and wanted another. We found one that had been sitting outside in MN for about 10 years, it was very rough but all the raw material was there. I had to cut the chain off to move it. The customer wanted something special, a stock looking hot rod. We went to work on the motor, higher compression, dual plugged the head, hotter cams and Mikuni carbs. Crank and rods magnifluxed and shot peened, rocker arms also lightened and shot peened. Other mods done to lighten and reduce friction. Powder coated frame and other black parts and a Kosmoski paint job with special design by the customer. Front end lowered, Norton peashooter mufflers along with many other custom bits. This bike won First in Class at the BBC Rallye (British Biker Cooperative), a WI based club dedicated to the preservation of the British Motorcycle. Click on the photo to the right to launch a slide show of this frame off rebuild of a 1976 T140V Bonneville. This beautiful 1938 Norton Model 50, 350cc classic needed some technical repair that few were able to do for the owner. Jeff helped get the transmission working again and later it needed a bit more help that Jeff was able to do, when parts were unavailable. Click on the photo to the right to launch a slide show of this beautiful 1938 Norton Model 50. We relace your wheels with new rims and spokes. We also replace bearings if needed and polish or paint the hubs, to make them look as good or better than new. When Indian Motorcycle was shooting a promotional video that appeared on their YouTube channel, they looked at virtually every motorcycle shop in the metro area, before they chose RedLine Cycle as the backdrop for their video shoot. If you are looking for the best Classic British Motorcyle shop in the Midwest, follow the lead of Indian Motorcyle and ride to RedLine Cycle! If you cannot ride there: call Jeff and he will help you get your bike rolling again. From tune-ups to complete restoration, trust RedLine Cycle for all your Classic British Motorcycle repairing, rebuilding and restoration needs. Jeff Phillips graduated from Hutchinson Vo-Tech's motorcycle mechanics course and went to work for Midway Suzuki Dealership for 1 season, then worked for WIW Triumph-Kawaski Dealership until 1985. 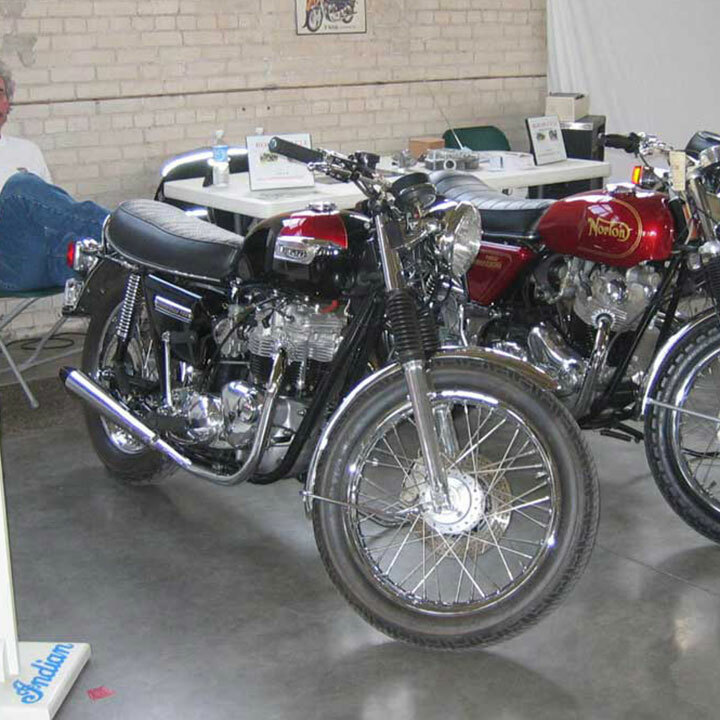 He started his company: Redline Cycle of Mpls in 1987, and has created what is one of the top Classic British Motorcycle restoration shops in the Midwest. Jeff has roadraced motorcycles at Brainerd Int'l Raceway, including class wins and 1st Place in the 1985 5-Hour Endurance Race; 750cc class, fourth overall. He also built the 'Stone Axe', a competitive 750cc Triumph twin hillclimber that he raced from the early 1980s thru the early 1990s. He was 10th in the Nation in 1990's. Jeff's abilities as a mechanic are some of the very best there is in the Midwest. He has developed specialized engine rebuilding machining methods and techniques to get the best possible results from these machines. His abilities and knowledge (secrets few know exist) yields results, combined with his specializing in these remarkable vintage motorcycles, makes Redline Cycle THE vintage British motorcycle shop in the Midwest. Jeff Hillclimb racing in 1994 at the Red Wing, MN Nationals; taking a 14th place. He went on to take a 10th in the nation win in Hillclimbing! Jeff was also a successful roadracer at Brainerd Int'l in the 1980s, seen here in 1985. Winning numerous roadraces and a prestigious 1st Place (750cc Class) in the 5 Hour Endurance Race; 4th overall. Lets take a short look at the history of the Classic British Motorcycle to get a better handle on just why we love these motorycles and why we specialized in repair, rebuilding and restoring of them. According to the official Triumph Motorycle website, Triumph Motorcycles Ltd is the largest British motorcycle manufacturer, established in 1983 by John Bloor after the original company Triumph Engineering went into receivership. The new company (initially Bonneville Coventry Ltd) continued Triumph's record of motorcycle production since 1902. During the 12 months preceding June 2017, Triumph sold 63,400 motorcycles. 1902 - The first Triumph motorcycle is produced, powered by a 2.2hp Minerva engine and subsequently known as No. 1. 1907 - A new 450cc motor making 3.5 hp is produced. As annual production reaches 1,000 units, the factory moves main production to a larger site on Priory Street in Coventry. 1915 - Triumph is chosen to supply the Type H ‘Trusty’ motorcycle for Allied military service. Of 57,000 manufactured, 30,000 of the 499cc air cooled single cylinder bikes see active service. 1927 - The Coventry factory, now standing at 500,000 sq ft and employing 3000 people, produces 30,000 units per annum. 1936 - Triumph’s car and motorcycle businesses are split. Edward Turner is appointed as chief designer. 1937 - Turner unveils the 498cc Speed Twin (T100) that has a top speed of over 90 mph. It is the definitive British motorcycle and establishes a pattern for Triumph bikes that will last more than 40 years. 1940 - Over 50,000 motorcycles are sold to the military as motorcycle production is geared towards the war effort. The Priory Street factory is demolished on November 14, 1940 in the blitz of Coventry. Temporary premises in Warwick are used until a new plant opens in Meriden in 1942. 1946 - With the return of peace, the company focuses on three models, the Tiger 100 (piloted to a maiden win at the 1946 Manx Grand Prix by Eric Lyons), the Speed Twin and the smaller touring 349cc 3T. All models feature a telescopic front fork. 1954 - Marlon Brando rides a 650cc Thunderbird 6T in ‘The Wild One’. 1955 - Johnny Allen hits 193 mph on the Bonneville Salt Flats, riding a streamliner powered by a tuned 650cc Thunderbird motor. It’s the start of a remarkable era of performance dominance, when Triumph held the absolute motorcycle land speed record for 15 consecutive years, except for one brief 33-day period. 1959 - The iconic T120 Bonneville 650 is introduced. Named in honour of the location of the setting of countless World speed records, the Bonneville is destined to become one of the greatest motorcycles, and the highest selling British twin of all time. 1963 - A TR6 650 Trophy is ridden, jumped and crashed by Bud Ekins, and more famously Steve McQueen, in ‘The Great Escape’. 1966 - Buddy Elmore wins the Daytona 200 on a factory-prepped 500cc Tiger. The Gyronaut X-1, a streamliner powered by two Triumph 650cc motors, records 245.6 mph on the Bonneville Salt Flats. 1967 - Gary Nixon proves that last year’s Daytona 200 win was no fluke by repeating the feat aboard a Tiger 100. Further racing success is enjoyed in the Production TT by John Hartle on a production TT. 28,700 Triumphs are sold in the USA. 1968 - The 750cc Triple finally makes an appearance, powering both the Trident and the BSA Rocket 3. Evel Knieval attempts to jump the fountain at Caesar’s Palace casino in Las Vegas on a Bonneville. 1969 - Malcolm Uphill wins the Production TT on a Bonneville. In the process he puts in the first-ever lap over 100 mph on a production motorcycle. Motorcycle production at Meriden peaks at approximately 46,800 units. 1970 - Malcolm Uphill again wins the production TT on a Triple destined for further fame and subsequently referred to as Slippery Sam. 1975 - Bonneville production continues after the workers form a co-op to keep the Meriden factory going. Slippery Sam wins the ten lap Production TT for the fifth year running. 1983 - The Meriden factory closes its doors. John Bloor acquires the Triumph name and Meriden site and licenses a small number of Bonnevilles to continue to be produced by Les Harris in Devon. 1987 - The first ‘new‘ Triumph motor, a 1200cc four cylinder, runs on a test bench. 1990 - Triumph returns! Six new models are unveiled at the Cologne Show: The unfaired Trident 750 and 900 Triples, the touring Trophy 900 Triple and 1200 Four and the sports-oriented Daytona 750 Triple and 1000 Four. 1994 - The game-changing Speed Triple is introduced and secures Triumph’s return to motorcycle sport at the inaugural ‘Speed Triple Challenge Race’. Triumph confirms is return to the USA with the introduction of a new subsidiary, Triumph Motorcycles America being founded. Planning permission is granted for a new factory on a 40 acre site in Hinckley. 1995 - The Triple Connection clothing range and accessory range of products are launched Production stands at around 12,000 units per year. The 30,000th Hinckley Triumph manufactured, a Thunderbird, ships to Australia. 1996 - The Daytona T595 bursts onto the scene. It’s stunning styling contributed to lengthy deposit lists. 12 months later, a T595 became the 50,000th motorcycle to be manufactured at Hinckley. According to Wikipedia, the free encyclopedia. The Norton Motorcycle Company (formerly Norton Motors, Ltd.) is a British motorcycle marque, originally from Birmingham, UK. It was founded in 1898 as a manufacturer of "fittings and parts for the two-wheel trade". By 1902, the company began manufacturing motorcycles with bought-in engines. In 1908, a Norton-built engine was added to the range. This began a long series of production of single and eventually twin-cylinder motorcycles, and a long history of racing involvement. When major shareholders started to leave Norton in 1953, the company declined and Associated Motor Cycles bought the shares. Although motorcycle sales went through a recession in the 1950s, and Norton Motors Ltd was only a small manufacturer, Norton sales flourished. A series of Norton Dominator Twins of 500 cc, then 600 cc, then 650 cc and then the 750 cc Norton Atlas kept sales buoyant, especially with sales to the USA. In 1968, the new 750 cc Norton Commando Model appeared, with the engine/gearbox/swingarm unit isolastically insulated from the frame with a series of rubber mountings. This kept the vibrations from the rider, giving a smooth comfortable ride. The Commando was a best seller, and voted #1 Motorcycle of the Year a number of times in Britain. 850 cc models appeared for 1973, giving more torque. For 1975 an electric start arrived in the 850 Mk3. In late 2008, Stuart Garner, a UK businessman, bought the rights to Norton from some US concerns and relaunched Norton in its Midlands home at Donington Park where it will develop the 961cc Norton Commando, and a new range of Norton motorcycles. From ClassicBritishMotorcycles.com (http://www.classic-british-motorcycles.com): an on-line index of British classic motorcycles. BSA MOTORCYCLES RULE THE WORLD! From the mid-1930's through the early 1960's, BSA was the world's largest producer of motorcycles. But their motorcycle division was just one small corner of the gigantic BSA financial empire at that time. In fact, BSA was one of the largest companies in the world for many years. At the opening of the 1960s, they were successful, well-respected, flushed with cash, and poised for greatness. Instead, they stumbled their way into receivership and obscurity. A true pity. As the 1950s came to a close, BSA Motorcycles was on top of the world. The BSA Gold Star was a mega hit, on the track & in showrooms, and the BSA A7 (500 twin) and A10 (650 twin) non-unit twins were solid sellers with a great reputation. BSA also owned Triumph, Ariel, Sunbeam & New Hudson, and this was just a small part of the BSA empire, which also included cars, buses, steel, heavy construction equipment, agricultural & industrial powerplants, machine tools, weapons, ammunition, military equipment, bicycles & more. They were a bona fide industrial giant, capable of accomplishing almost anything & in far better financial shape than just about anyone else in the motorcycle business. By 1970, the once-mighty BSA was broke & irrelevant as a motorcycle company. Even Triumph, the jewel in BSA's crown, already on death's door, was taken over by its workers in their failed attempt at independence. How the mighty fall. We are conveniently located in South Mpls. Check back with us in the Fall, as we are restoring a few Nortons and Triumphs this summer as time permits. Our expertise in engine rebuilding and machine work for motor overhauls is all done in-house, with few exceptions. With over 31 years in working on British Bikes, we have found betters ways and tooling to take care of problems common to these bikes. See our Desktop & Tablet version of this site, for slide shows that show exactly how nice our work is.